Call The Aerial Guys today on 01257 543032 for a no obligation estimate and to arrange an appointment. If you live in Chorley and are looking for local TV or satellite installation and repair experts, then call The Aerial Guys. We are passionate about providing you with the best possible service. Contact us today on 01257 543032 to book an appointment. We have an extensive network of engineers, which means if you are looking for a TV aerial repair in Chorley, we can always promise an engineer is available to visit your home, usually on the day you contact us. After working on numerous TV aerial installations in Chorley over the years, we really do know our business well. And, unlike some of the larger companies, The Aerial Guys will always guarantee to deliver a reliable, local service that you can depend on. Call us today on 01257 543032. Our professional and friendly engineers will assess your TV aerial repair requirements on arrival, always offering you a fixed quote before any work begins. From TV aerial repairs in Chorley, to installing a new TV setup, The Aerial Guys are always on hand to make sure you get the best picture possible. Why not speak to one of our technical advisers today on 01257 543032 to find out how to arrange a visit from your local Chorley engineer. At The Aerial Guys, we are also experts in satellite installation and repairs. If you are looking for a comprehensive satellite TV installation in Chorley, then our engineers can install the entire kit – from fitting your satellite dish, to configuring your set-top box and even sorting out the cabling. At The Aerial Guys, we have specialist knowledge in all the main satellite services, including Sky, Freesat and European satellite installations. Are you finding that your satellite signal is intermittently scrambled or pixelated? Put your worries to one side, as The Aerial Guys can carry out full satellite repairs in Chorley and the surrounding area. Our professional engineers keep in stock a wide range of equipment suitable for all the main satellite platforms, which means that we can often fix the problem there and then. 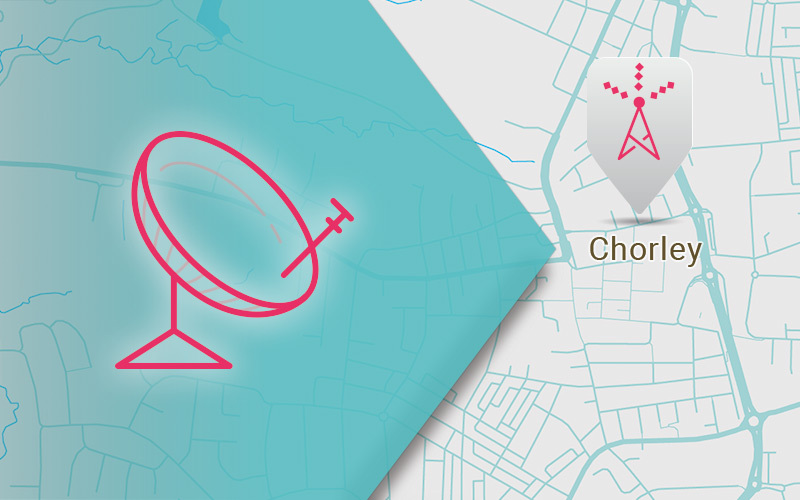 So, if you live in the Chorley area, and need a local satellite repair service, make sure you speak to The Aerial Guys today on 01257 543032. If you live in Chorley and are looking for local TV or satellite installation and repair experts, then call The Aerial Guys. We can be with you really quickly, usually on the same day you call us. Contact us today on 01257 543032 to book an appointment. Freesat dish alignment, like any satellite alignment, is a bit of an art-form. Freesat channels are beamed to the UK via the Astra 28.2°E group of Astra communications satellites. The Aerial Guys have an encyclopaedic knowledge of satellite alignments and frequencies. So, for the best possible satellite dish alignment for Freesat, you can trust us to give you the clear picture. Madison is a mum to three small children. “I know we shouldn’t use the TV with the kids so much, but it’s impossible to be with all three of them at the same time. If we didn’t have our satellite system then all hell would break loose,” Madison laughs. But she and her family started to receive an increasingly poor signal, to the extent that some channels just weren’t accessible anymore. “I put it down to the weather at first but after a couple of weeks it was just getting ridiculous. I decided to call The Aerial Guys to see if they could help,” she says. After talking to a technical adviser, an engineer was sent to Madison’s house the same day. “I couldn’t believe how fast and efficient the service was. The guy who came to our house was really good and the quote was better than I’d expected. I just felt really relaxed about it all. The Aerial Guys put me at ease straight away. Now everything is running smoothly with the TV, all I have to worry about is who is going to watch which programme when!” Madison says.